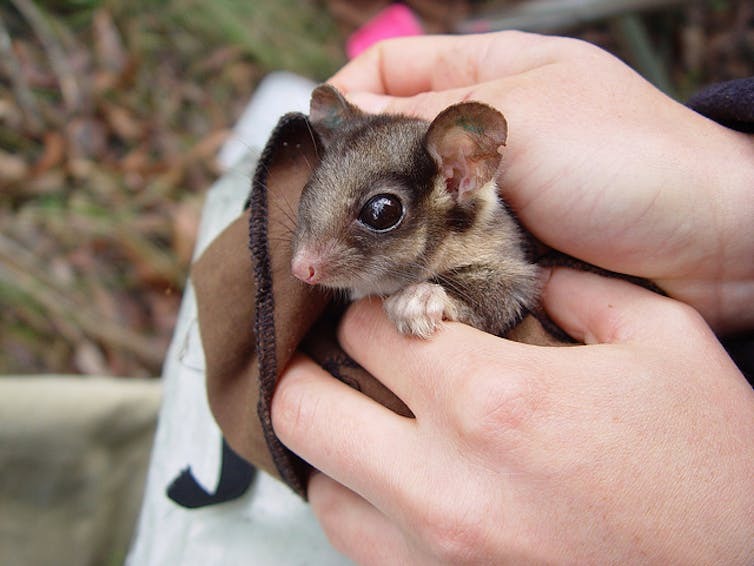 The critically endangered Leadbeater’s Possum lives within a single federal electorate. Their local MP has a responsibility to be their voice. Australia is rapidly losing its world-famous biodiversity. More than 90 species have gone extinct since European colonisation (including three in just the past decade), and more than 1,700 species are now formally recognised as being in danger of extinction. Despite the pride many Australians feel in our unique natural heritage (and the billions of dollars made from nature-based tourism) the amount of federal funding for biodiversity conservation has dropped by 37% since 2013. If a local industry or public institution experienced such a drastic funding cut, the people affected would petition their local representatives and the issue would be raised in parliament as a matter of local or national importance. Threatened species cannot of course lobby government. But all threatened species on the land have at least one elected official who should take responsibility for them. A member of parliament’s primary job, besides being a party member and parliamentarian, is to speak up for local interests. Data from the Species of National Environmental Significance shows that every federal electorate contains at least one threatened species, so every single federally elected politician has a role to play in abating species extinction. This is because species are not uniformly spread across the landscape, and also because electorate size varies hugely according to population density. The biggest electorate is the Division of Durack, which at 1.6 million square kilometres is half the size of Germany, while the smallest (the Division of Grayndler in inner Sydney) is 0.002% Durack’s size. Because extremely large seats are in remote and rural areas, they are dominated by Liberal and National politicians. Melissa Price, the Liberal member for Durack, represents 359 threatened species, or about 20% of Australia’s total. The box below highlights the 10 seats with the most threatened species. 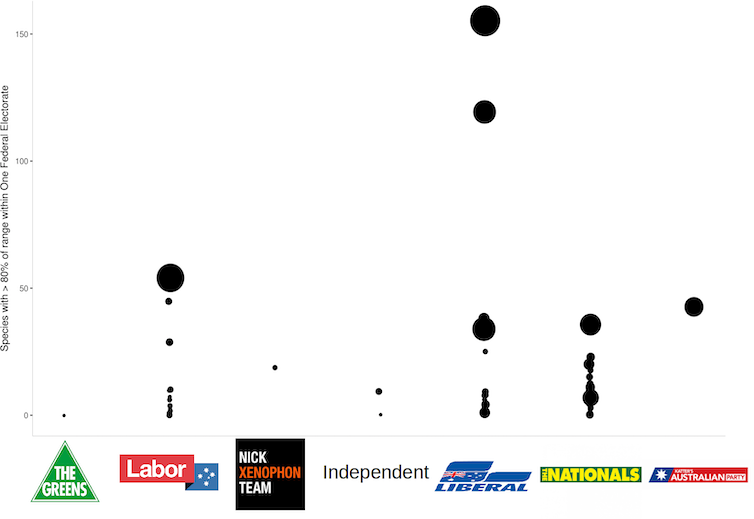 Between them, the members for these 10 electorates represent 609 – or 36% – of all threatened species in Australia. These MPs need to be empowered to protect the natural heritage of their electorates. While this issue affects every MP, some 79 electorates contain a species that resides mainly – or even only – inside that electoral boundary. 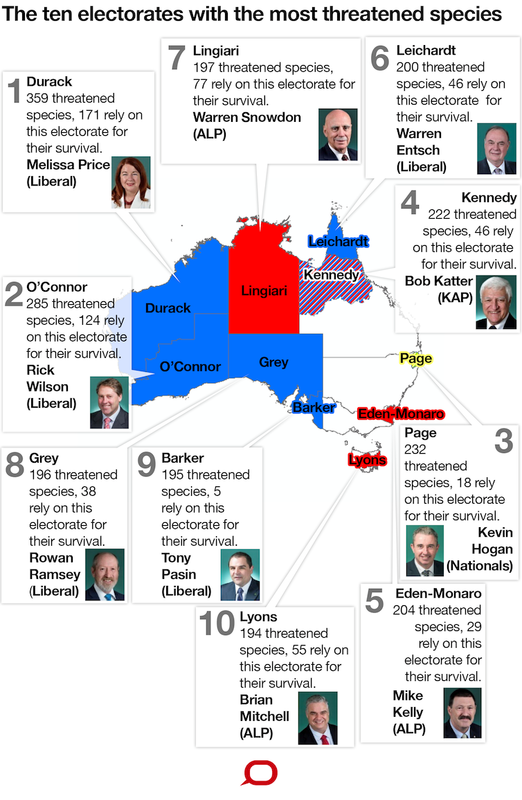 Several electorates have more than 50 species that rely on habitat found in one electorate, including the divisions of Durack (Liberal), O’Connor (Liberal), Lingiari (Labor), and Lyons (Labor). The figure below shows electorates that contain more than 80% of a species’ range. The size of the bubble scales directly to the size of the electorate. It’s clear that some electorates are important sites of biodiversity. For example, Warren Entsch, the Liberal National member for Leichardt, has the endangered Golden shouldered parrot living entirely within his electoral boundaries. The federal division of Canberra, represented by Labour MP Gai Brodtmann, contains the entire habitat of the spectacular Brindabella Midge-orchid. These are just two of 79 members who can make such a claim. Local members should not just be aware of this but active in saving these species. While many of the factors that imperil threatened species come from far outside an electorate’s borders, local threatened species need local voices. As arguably the strongest local voice, all federal MPs can fight for more money and more action for threatened species, especially those within their electoral boundaries. And given the inequity in terms of threatened species per electorate, some will need to fight for much greater resourcing than others. Extinction is forever, and every time we lose a species our world becomes a poorer place. Ultimately, only local action on the ground can prevent the irreversible loss of our precious threatened species.